The East Lothian Council area lies in the south east of Scotland, bordered by the Firth of Forth and the North Sea on its northern and eastern sides, and by the Scottish Borders to the south and Midlothian (Edinburgh) to the south and west (Figure 1). East Lothian is renowned for its attractive rural landscape and beautiful coastline. These features have their origins in the underlying geology and the geological processes that act upon the land. The diverse bedrock that underlies East Lothian has been sculpted by the erosion of rivers, glaciers and the sea over recent geological past (the Quaternary period). Landforms and deposits from the recent processes form characteristic features in the landscape. Furthermore, the picturesque towns and villages owe their distinct regional character to the local stone used in the walls and buildings. 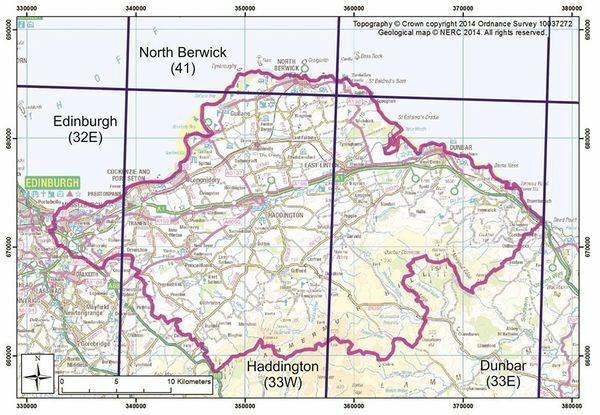 Figure 1 Location of East Lothian Council area (pink outline) and the distribution of 1:50 000 scale BGS geological map sheets (blue lines). In the following review of the bedrock and superficial (Quaternary) geology of East Lothian, information was derived from the published geological maps of the area; BGS 1:50 000 scale map sheets 32E (Edinburgh), 33W (Haddington), 33E (Dunbar), 41 (North Berwick), and the geological memoir for Haddington (McAdam and Tulloch, 1985). East Lothian lies across the south-eastern margin of the Midland Valley of Scotland. The Midland Valley is the name given to the relatively low lying part of central Scotland located between the uplands of the Scottish Highlands to the north and the Southern Uplands to the south. Geologically it is defined by two large fault systems: the Highland Boundary Fault, which lies to the north and extends from Stonehaven in the northeast to the Firth of Clyde at Helensburgh, and the Southern Upland Fault which extends from Dunbar to Glen App. The downfaulted area between the two faults contains rocks of mainly Carboniferous and Devonian age (Figure 2, Figure 3). The Southern Upland Fault bisects the landscape of East Lothian, separating the upland moors of the Lammermuir Hills to the south-east from lower, rolling terrain in the north-west that stretches from Haddington and Pencaitland to the coast. In this area, the Southern Upland Fault system comprises two faults, the southern Lammermuir Fault and the Dunbar-Gifford Fault. 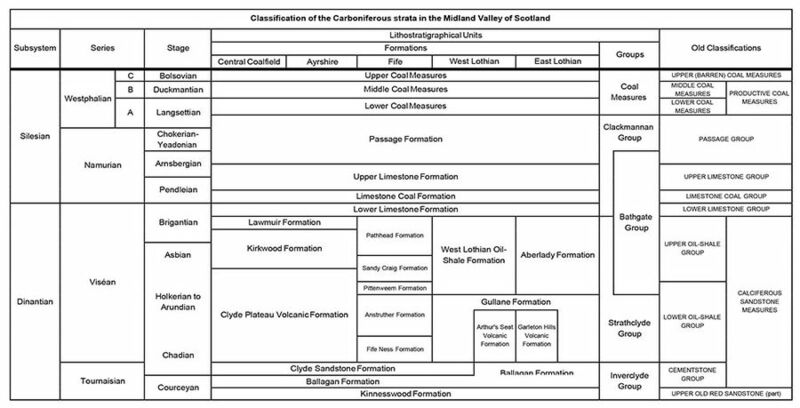 Table 1 Classification of the Carboniferous strata in the Midland Valley of Scotland. Note: The Laggan Cottage Mudstone Formation of north Arran and the Birgidale Formation of south Bute at the base of the Strat hclyde Group are not shown. Nor are the Bathgate hills, Kinghorn and Salsburgh Volcanic formations of the Bathgate Group. Older, Lower Palaeozoic rocks (460–430 Ma) crop out to the south of the Lammermuir Fault, represented by fissile sandstones and siltstones known as greywacke that underlie the Southern Upland terrain. In the east, these rocks are overlain by conglomeratic rocks of Lower Devonian age (430–390 Ma) that were once deposited over the eroded surface of the Lower Palaeozoic rocks by large rivers. To the north of the Lammermuir Fault, the rocks that crop out in the East Lothian area are of late Devonian to Carboniferous age (380–360 Ma). These rocks consist of a sequence of sedimentary and igneous strata that were laid down in a gradually subsiding basin. During the late Devonian and early Carboniferous, rivers traversing a hot, humid lowland plain deposited sand and mud, which was colonised by early land plants. These sediments later formed the variable sequence of sandstone, siltstone, mudstone, dolomitic limestone and seatearths (preserved soils) known as the Ballagan Formation. The rich late Devonian environment of rivers and shallow-water lakes formed an ideal setting for the evolution of land-going animals (tetrapods), and the study of early tetrapod fossils found in the Ballagan Formation of the Scottish Borders and East Lothian, as well as the environment in which they lived, is a key area of current geological research. Later Carboniferous rocks (360–300 Ma) are represented in East Lothian by a sequence of volcanic and sedimentary strata (Strathclyde Group), with older rocks exposed in the east and younger rocks to the west. The Garleton Hills Volcanic Formation, a sequence of lavas and tuffs (volcanic ash deposits) formed during a period of eruptive volcanism during the mid- Carboniferous, crop out at the base of the Strathclyde Group in the east of the area and are exposed along the coast near North Berwick. Overlying the volcanic rocks to the west are a series of units of sedimentary rocks including sandstones, mudstones and limestones deposited in varying marine, shallow marine, and terrestrial fluvial environments arising from changes in relative sea level during the mid to late Carboniferous. The youngest rocks in East Lothian comprise strata of the Coal Measures Group (Scotland) formed by cyclic deposition of sandstone, mudstone, siltstone and coal in a swampy forest environment crossed by large river systems. The sequence of Carboniferous rock units in East Lothian is shown in Table 1. East Lothian displays a diverse range of glacial and coastal landforms and deposits (Figure 4), which reflect the influence of erosion and deposition during the past 2.6 million years, a time known as the Quaternary period. During the Quaternary, Scotland was covered repeatedly by large ice sheets that extended from the mountains westwards across the continental shelf and eastwards across the floor of the North Sea to merge with Scandinavian ice. Along the coast, the position of the coastal edge changed as sea-levels fell and rose as the glaciers expanded and retreated. In East Lothian, most of the glacial evidence relates to events during the most recent glaciation, the Late Devensian (c.31–11.7 Ka). During this time, large glaciers sourced in the Highlands and Southern Uplands, coalesced in the southern part of the Midland Valley to form a vast sheet of ice that streamed across the area towards the east. Erosion beneath this large glacier has left a legacy of scoured bedrock and streamlined deposits across the East Lothian landscape. The broad outlines of the landscape of East Lothian reflect differential erosion of the varied sedimentary and volcanic rocks over many millions of years. North of the Southern Upland Fault, the more resistant volcanic rocks generally form areas of upstanding relief that have been streamlined or eroded into crag-and-tail landforms by glacial scouring (e.g. the Garleton Hills, North Berwick Law, Traprain Law). The lower ground is extensively mantled by till which was deposited and streamlined by the glacier ice, and by sand and gravel deposited by meltwater streams flowing beneath or adjacent to the Late Devensian ice sheet. Erratic boulders, including metamorphic rocks of Highland origin, commonly occur along the coast and are particularly well displayed where they have been washed out of till along the shore platforms. At Kidlaw, a mass of limestone c.0.2 km2 forms the largest known erratic in Scotland (Kendall & Bailey, 1908). Meltwater channels carved into till and bedrock by subglacial and ice marginal streams, are common along the northern flanks of the Lammermuir Hills, where they are associated with kame terraces, ice-marginal lake deltas. As the climate warmed rapidly after 15 ka, the ice retreated from the lowlands and vegetation became established. As the ice receded, relative sea-level rose and the sea invaded the lower parts of the coastline forming Lateglacial raised shorelines along many areas of the East Lothian coast. In the Tyne estuary, cold-water estuarine deposits containing arctic marine fossils were laid down adjacent to the retreating glaciers. In a former claypit at West Barns, bones of a Ringed seal (Phoca hispida) were also recovered (Peacock, 1999; Davies et al., 1986). The subsequent return of a severely cold climate gave rise to periglacial conditions between 12.9–11.7 ka. During this period, slope and fluvial activity were enhanced; thick slope deposits (head) accumulated on the lower slopes of the Lammermuir Hills, and talus formed in the Garleton Hills. During early postglacial times, a further period of higher relative sea level culminated after around 7000 years ago. Subsequent changes in relative sea level produced further raised shorelines along many parts of the coast. As the sea dropped to its present level, continued reworking of the coastal sediments has formed extensive sandy beach and sand dune systems in many bays, as well as areas of mudflats and saltmarshes. In an embayment at Lochhouses, layers of marine deposits occur behind the coastal dune barrier (Newey, 1965; Robinson, 1982). One of these sand layers is attributed to a tsunami generated by a massive landslide on the Norwegian slope 8100 years ago (Smith et al., 2004). Erosional coastal landforms including shore platforms and cliffs of various ages occur along the coast. The interplay between coastal erosion and the different volcanic and sedimentary rocks has produced a variety of distinctive headlands, stacks, natural arches and cliffed islands such as the Bass Rock. Inland from the coast, postglacial rivers have adjusted to changing discharges and sediment loads as reflected in terrace formation, floodplain development, abandonment of meanders and abandoned channels including those on the lower River Tyne. On upland slopes, gullying processes in weathered bedrock have resulted in the formation of areas of ‘badland’ topography in the Lammermuir Hills (Werritty & McEwen, 1997). Sites of Special Scientific Interest are areas designated by Scottish Natural Heritage (SNH) under the Nature Conservation (Scotland) Act 2004. These sites are representative of features of our natural heritage and include examples of plant and animal habitats, rocks and landforms that are considered to be nationally important. There are 15 SSSIs in the East Lothian area, of which seven have been designated wholly or in part due to their geological or geomorphological features (Table 2). With one exception, the large Firth of Forth SSSI, the geological SSSIs have not been included as geodiversity sites in this audit due to their pre-existing designation. 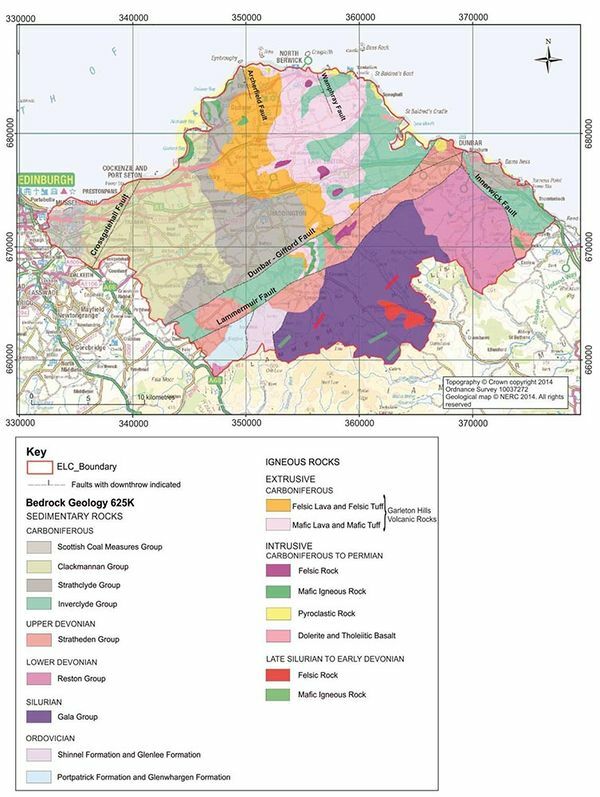 The geological SSSIs should be viewed as key geodiversity sites in conjunction with the sites identified in this report. The Firth of Forth SSSI covers 74 km2 of coastline along the full length of the northern and southern margins of the Firth of Forth, including many areas of the East Lothian coast. This large SSSI has been designated for both its biological and geological importance. 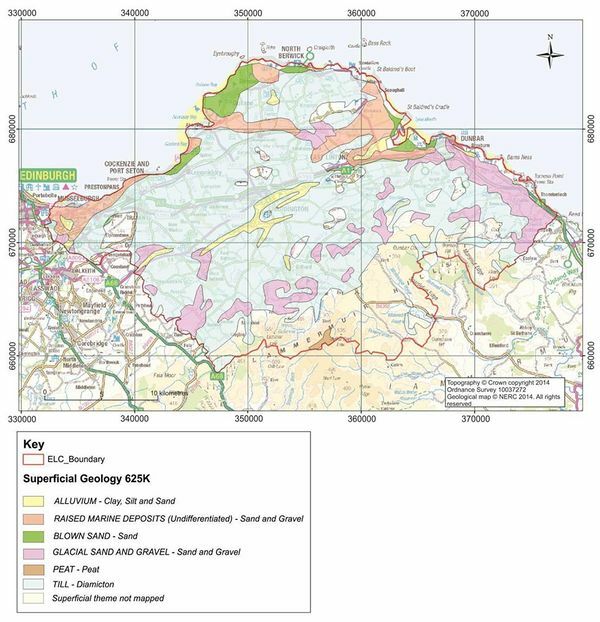 However, the size of the site means that particular geological significance of specific areas of the East Lothian coast included within the SSSI is not fully represented. Geodiversity sites located along sections of the East Lothian coastal zone that fall within the Firth of Forth SSSI have been identified in this report. The designation of these sites within the Firth of Forth SSSI is noted in the site assessments. 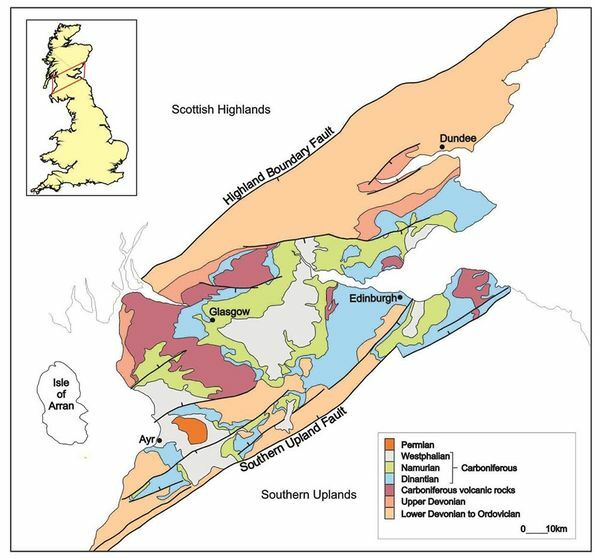 Figure 4 Superficial deposits of East Lothian. Geological resources include building stones and minerals that are extracted for construction materials and energy generation. In the west of East Lothian, coal has been extracted from strata of the Coal Measures Group since the 13th century and the landscape bears many reminders of the former mining activity including disused shafts and adits. The mining heritage has also influenced the development of towns and villages in the area and is reflected in many of the local place names. In addition to mining, industries such as brick production have historically provided other important connections between the geology and the economy of East Lothian. Local sandstone, extracted from numerous small quarries in the Carboniferous sedimentary strata, has been used in many of the historic buildings found in East Lothian from the region’s castles to its cottages. The use of local stone lends a distinct character to many of the picturesque villages. Igneous rocks have also been quarried in many areas for road stone. Small but distinctive quarries are found on some of the prominent igneous landforms of the region such as Traprain Law (and SSSI) and North Berwick Law. Quarries in the extrusive igneous strata of the Garleton Hills were important early sites for the study of these rock types. Several quarries in the region became type sites for early classification schemes of volcanic rocks with the names of the quarries used to denote the distinct types of basaltic rocks they contain (e.g. Dunsapie and Markle). The distinct rocky coastline of East Lothian has exerted an important control on the siting of harbours and their associated towns and villages. The strong geological influence on the form of the harbour and its development is evident in Dunbar for example. The strategic importance of these harbours for trade and commerce can also be seen in the presence of historic military sites (including castles) along the East Lothian coast. ↑ MCADAM, A D and TULLOCH, W. 1985. Geology of the Haddington district. Memoir of the Geological Survey, 1:50 000 Sheet 33W (Scotland). ↑ KENDALL, P F, and BAILEY, E B. 1908. The glaciation of East Lothian south of the Garleton Hills. Transactions of the Royal Society of Edinburgh, 46, 1–31. ↑ PEACOCK, J D. 1999. The pre-Windermere Interstadial (Late Devensian) raised marine strata of eastern Scotland and their macrofauna: a review. Quaternary Science Reviews, 18, 1655–1680. ↑ DAVIES, A, MCADAM, A D, and CAMERON, I B. 1986. Geology of the Dunbar district. Memoir of the Geological Survey, 1:50 000 Sheet 33E and part of Sheet 41 (Scotland). ↑ NEWEY, W W. 1965. Post-glacial vegetational and climatic changes in part of south-east Scotland. Unpublished PhD thesis, University of Edinburgh. ↑ ROBINSON, M. 1982. Diatom analysis of early Flandrian lagoon sediments from East Lothian, Scotland. Journal of Biogeography, 9, 207–222. ↑ SMITH, D E, SHI, S., CULLINGFORD, R A, DAWSON, A G, DAWSON, S, FIRTH, C R, FOSTER, I D L, FRETWELL, P T, HAGGART, B A, HOLLOWAY, L K, and LONG, D. 2004. The Holocene Storegga Slide tsunami in the United Kingdom. Quaternary Science Reviews, 23, 2291–2321. ↑ WERRITTY, A, and MCEWEN, L J. 1997. Oldhamstocks Burn. In: Gregory, K J. (ed. ), Fluvial Geomorphology of Great Britain. Geological Conservation Review Series No. 13. Joint Nature Conservation Committee, Peterborough, 97–99. This page was last modified on 16 June 2016, at 13:54.